Include Ibiza in your sailing itinerary along the Spanish Riviera and you will experience the best of the island’s natural beauty coupled with all the gentle hedonism it has to offer. The island’s diversity means you can be as loud or quiet as you want. In the mood for a party? Book VIP tickets and hit the legendary El Divino, a state-of-the-art club on the marina comprising five bars, a restaurant and a VIP deck on the water. You could also try the other party hotspots, including Amnesia, Pacha, Privilege and Space. A highlight for many visitors is the Pukka Up boat parties. Featured on MTV and BBC TV, these floating fiestas are hugely popular and combine endless oceans, drenching sunshine, great music and beautiful people. Opt for a sunset party because, with cocktail in hand and chilled-out beats, there is no better way to experience Ibiza’s stunning skyscapes. 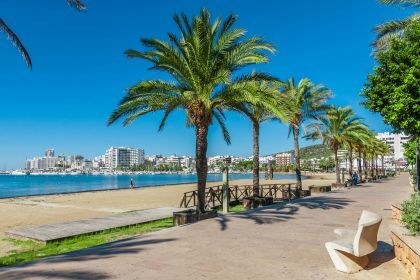 If you want something quieter, the resort town of Talamanca has a white-sand beach, turquoise waters and rolling green hills. Portinatx, with its abundant gardens, protected bay and crystalline sea, has three beaches and perfect conditions for snorkelling and windsurfing. In San Antonio – popular with British holidaymakers – luxury yachts are often moored in the marina and the town buzzes with visitors. Along with fun and adventure, Ibiza also serves up excellent food at top restaurants such as BamBuddha Ibiza in Santa Eulalia del Rio. Its opulent design, celebrity clientele and MediterrAsian cuisine will satisfy even the pickiest of eaters. 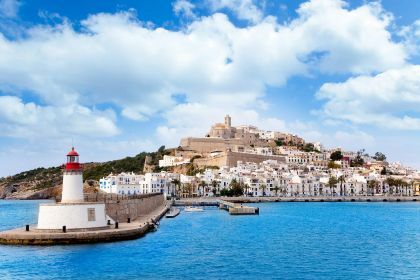 Ibiza town also has a wealth of fine-dining venues, including El Olivo, La Torreta, Dalt Vila and Restaurante S’Ametller. Booking is advised in high season. And if you feel the need to work off your dessert (or show off your tan), Ibiza has many outdoor activities to suit all tastes. How about a round or two of golf on a 27-hole course in Club de Golf Ibiza? Or a game of polo at the Ibiza Polo Club, which caters for all proficiency levels? If adrenaline sports are your thing, why not try cliff diving or high-speed jet skiing? A vacation is incomplete until you’ve done some shopping – and there is nowhere better for this than at La Galeria Elefante, a concept store selling everything from souvenirs and home décor items to clothing and vintage garden accessories. 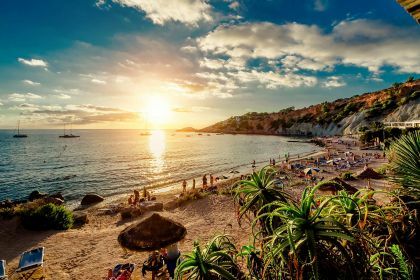 To rephrase the old saying: if you are tired of Ibiza, you are tired of life. Or better yet, if you are tired of life, come to Ibiza. It will replenish your zest for life as quickly as an attentive bartender refills your glass. To get the best of the Spanish Riviera, include Mallorca and Barcelona in your cruise itinerary. Call your friendly Abberley broker to get all the help you need for an unforgettable yachting vacation in Ibiza and Spain. You can also contact us online here.